Commercial vehicle supplier Meritor Inc. notched higher revenue and net income in its fiscal-year third quarter, citing new business wins and higher production in all of its major markets. Net income for the period ended June 30 rose 33% to $64 million, or 71 cents per diluted share, compared with $48 million, or 51 cents, in the same period last year. Meritor posted revenue of $1.1 billion, up $209 million or 23% from a year earlier. “In our third quarter of fiscal-year 2018, we continued to successfully capitalize on higher commercial vehicle volumes and revenue outperformance in the majority of our end markets globally,” Meritor CEO Jay Craig said in a statement. “The strength in our markets, combined with excellent operating performance by our global team, is reflected in higher revenue, expanded EBITDA [earnings before interest taxes depreciation amortization] margin [12%] and strong free cash flow generation [$102 million compared with $94 million a year earlier],” he said. The company has two reportable segments. The commercial truck and trailer segment supplies drivetrain systems and components, including axles, drivelines, and braking and suspension systems, primarily for medium- and heavy-duty trucks and other applications in North America, South America, Europe and Asia Pacific. It also supplies a wide variety of undercarriage products and systems for trailer applications in North America. This segment includes the company’s aftermarket businesses in Asia Pacific and South America. This unit’s sales were $904 million in the third quarter of fiscal 2018, up 24% compared with the year-earlier period. The increase in sales was primarily driven by higher production in all of Meritor’s major markets and revenue outperformance. The aftermarket and industrial segment supplies axles, brakes, drivelines, suspension parts and other replacement parts to commercial vehicle and industrial aftermarket customers, primarily in North America and Europe. This segment also supplies drivetrain systems and certain components, including axles, drivelines, brakes and suspension systems for military, construction, bus and coach, fire and emergency and other applications in North America. Sales for this unit reached $273 million, up 15% compared with the previous third quarter. The increase was driven by higher aftermarket volumes in North America and a rise in sales in its Industrial business. During the quarter, the Troy, Mich.-based company acquired substantially all of the assets of AA Gear & Manufacturing Inc. for $36 million in cash. AAG provides low- to medium-volume batch manufacturing for complex gear and shaft applications, as well as quick-turnaround prototyping solutions and emergency plant support. 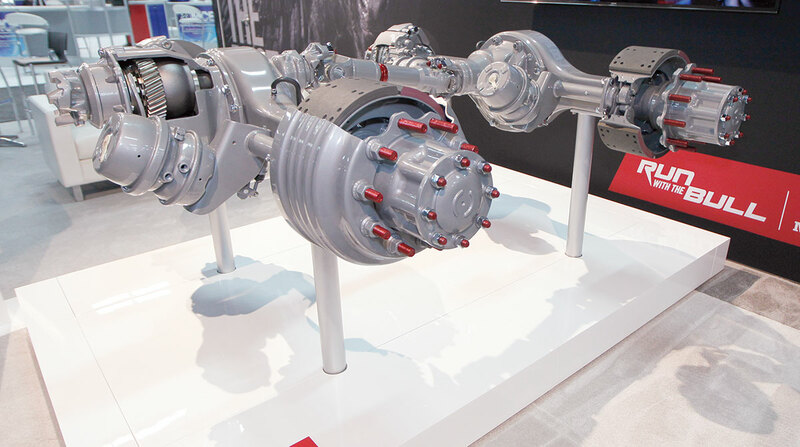 Also, Meritor completed a $3 million strategic investment in Transportation Power Inc. — which develops electrical drive solutions and supplies integrated drive systems, full electric truck solutions and energy-storage subsystems to major manufacturers of trucks, school buses, refuse vehicles and terminal tractors. Meritor noted it is not the primary beneficiary of TransPower, as other owners have control over the significant activities of TransPower, including the development of intellectual property and manufacturing.